Plot Outline: Several months have passed since The X-Men defeated Magneto and imprisoned him in a seemingly impregnable plastic chamber. One day, a mutant by the name of Nightcrawler infiltrates the White House and attempts to assassinate the president, setting off a chain reaction of anti-mutant measures by the government. Meanwhile, Logan is trying to discover his past. As scientist named William Stryker discovers Professor X's secret school and Cerebro, Magneto's partner, Mystique, is planning to break her leader out of prison. 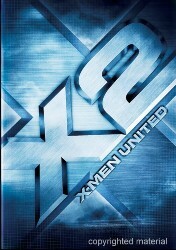 But when Professor X's school is attacked by Stryker's forces, Logan, Rogue, Iceman and a few are lucky to escape. Those who remain meet in Boston, where they form an uneasy alliance with Magneto to stop Stryker and rescue Professor X.